I first saw this pen here. Hmmm…buttery smooth nib. That phrase will get my attention EVERY time. I did a little more stalking, and watched this review. (Same pen, just in the Croco style.) More confirmation of an ultra-smooth nib. With both Dan and Stephen on board, how could I go wrong? So I shopped around, but waited until I had some Christmas money to make my purchase. 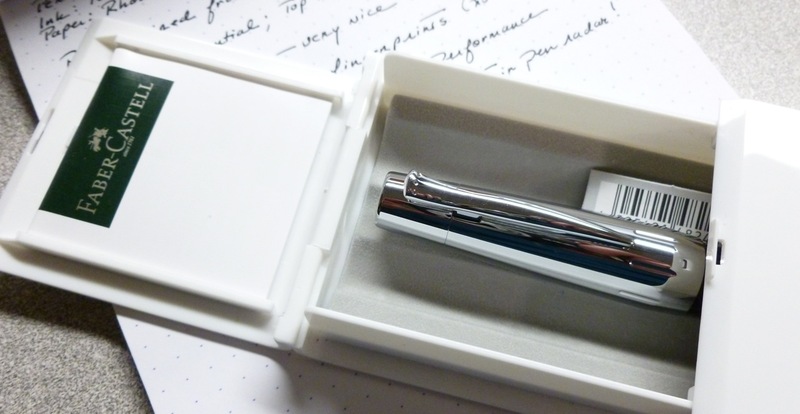 After Christmas, I spent a few days re-reading and re-watching the reviews (as is my MO), then pondered the eternal fountain pen question…which size nib? As I mulled this over, I chatted with a pen friend on Twitter and casually mentioned that the e-motion was going to be my next pen purchase. Then another tweet popped up, this one from Dan Smith (one of the FPGeeks himself!). Turns out he had an e-motion for sale, brand new, medium nib, great price. Sold! Talk about good timing. 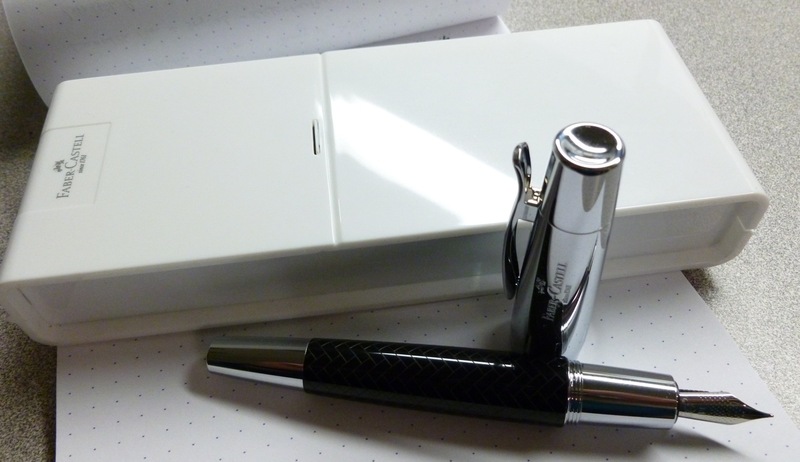 I filled the pen with my go-to black ink…Montblanc’s Mystery Black, then wrote and wrote and wrote. Mostly nonsense, but still. 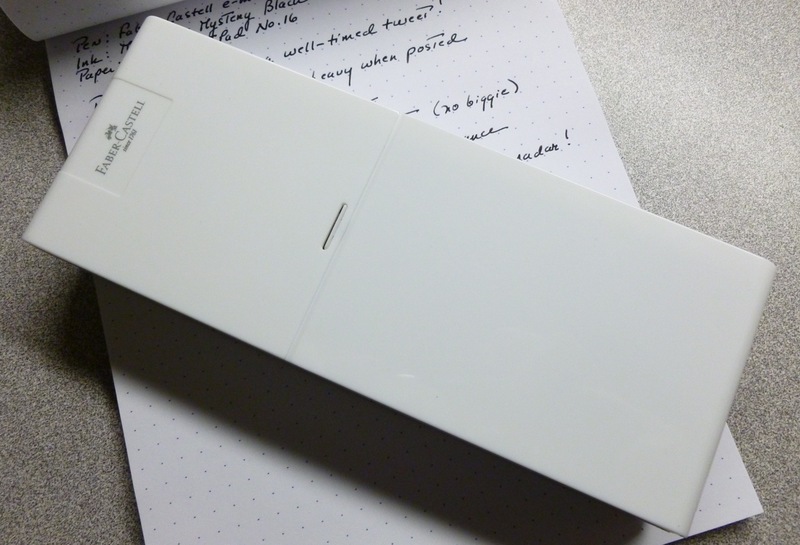 The Faber-Castell is exactly as I hoped it would be…heavy, well-balanced, great looking, and yes…very smooth. 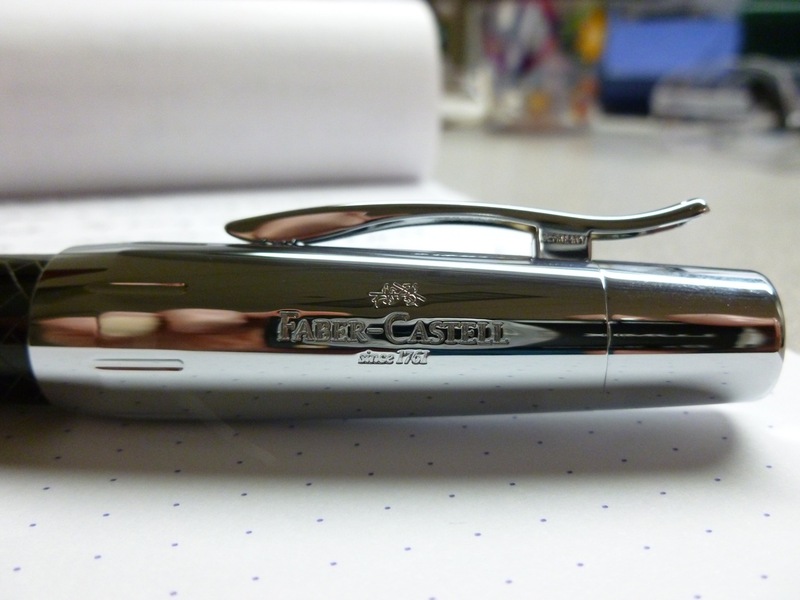 The nib is stainless steel and lovely. Of the pens I own, I’d rank it as my 3rd smoothest, JUST behind the Sensa Meridian and the Tiger Stripey by Ken Cavers. High praise, indeed. The black resin body is laser-etched with a parquet pattern that looks a little like braided leather. The pen is HEFTY, but not at all cumbersome, unless you post the cap. The chrome cap is quite substantial and adds just a bit too much weight to the back end. 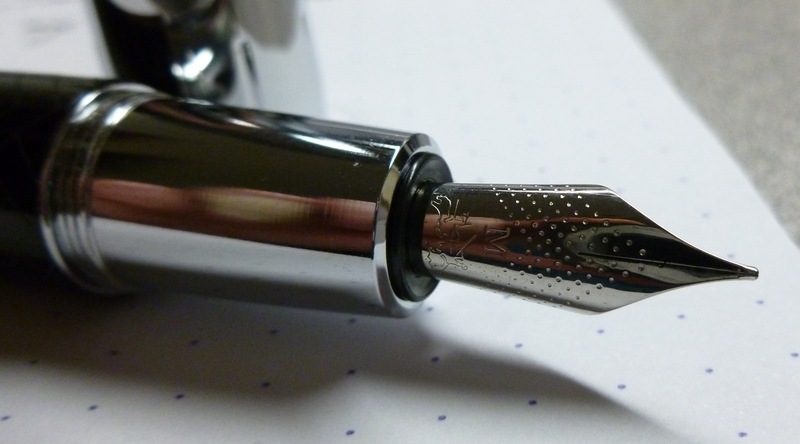 It’s not impossible to write with the cap posted (and I do, sometimes), but I generally prefer to use the pen unposted. The spring loaded clip is wonderfully curved (a bit like a ski jump, as Stephen notes in his video). I haven’t carried it in a pocket, so I can’t comment on how well the clip keeps the pen in place, but it FEELS like it’d do the job just fine. Though I lean toward fine and extra-fine nibs, I’m glad that this medium nibbed pen serendipitously came my way. It’s a joy to use, to look at, and to polish. The line is bold and, as has been stated (and stated) super smooth. 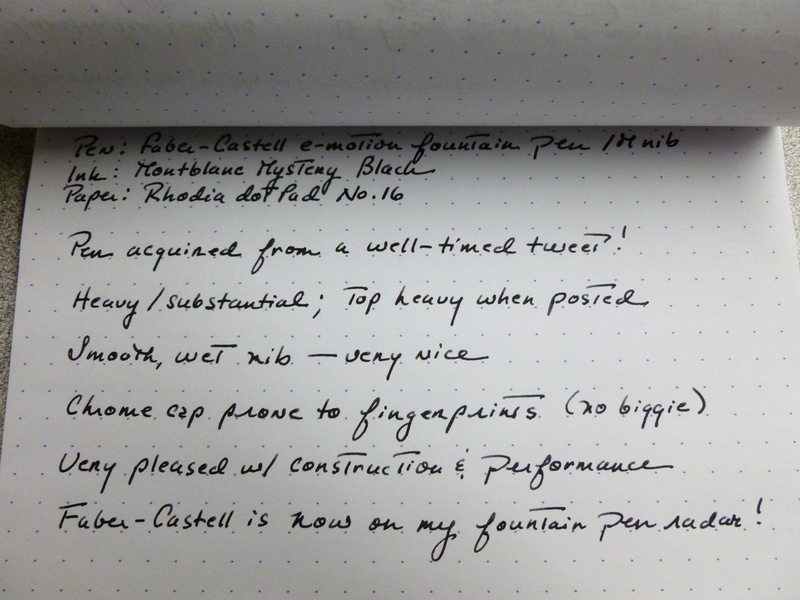 I had a feeling that Dan and Stephen wouldn’t steer me wrong, and at least as far as the Faber-Castell e-motion fountain pen goes, I was right to follow the leaders.